A young designer from the Royal College of Art in London, Revital Cohen, described a world in which animals might replace the machines and medical devices keeping many humans alive. She spoke to an audience attending the Expo, Design Indaba in Cape Town, South Africa at the end of February. Her presentation was about her "Life Support Project." One example Ms. Cohen discussed was the use of greyhounds as a possible respiratory assistance dogs. As a greyhound bred to race is trained to chases a lure, spends up to five years chasing that lure, and is then generally euthanized, why not train the dog as a respiratory assistant instead of killing the dog? Citing that a greyhound with his large chest and need for exercise is well suited to this job, the dog would also not succumb to separation anxiety because he would be a constant companion to the person depending on him for his life. Another possibility Ms. Cohen proposed is to use a sheep as a "dialysis machine," first designing a sheep for that purpose , and then connecting the sheep to a patient suffering from kidney failure via "blood lines" to the patient. The sheep's kidney would cleanse the blood, urinating its toxins, and return the cleansed blood to the patient. Ms. Cohen's primary goal seems to be to keep both the patient and animal alive in the case of the greyhound, but mostly to provide the patient with companionship in the case of the sheep, as the sheep would have to be transgened specifically for the job of "dialysis machine." Giving a racing dog a new purpose in life rather than euthanizing it is a good thing. 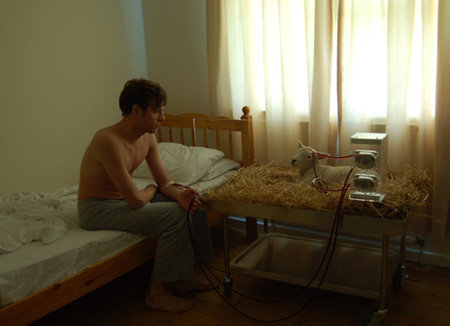 However, I'm skeptical about subjecting the sheep to what is a medical procedure. 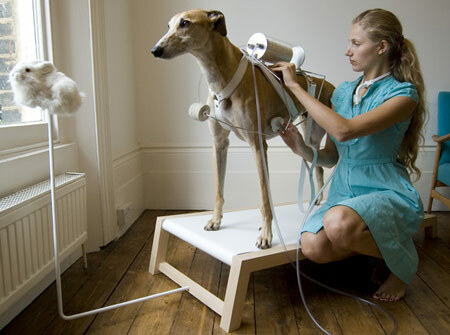 But I do think that the subject of animals replacing (some) technologies is interesting and worth exploring. NO! It is one thing to have therapy animals and companion animals, it is another to be hooked up to their vital organs. I do not agree with or believe in this. This is so wrong!! Greyhounds, after their running years are over, are the most wonderful companions the dog world has produced. These hounds should be given the utmost respect and not simply used to prolong human life by stealing the breath from another life form. Greyhounds need their bodies intact to live a long and healthy life. Sheep, or any other animal, often give their lives to feed the humanity of this world. Now folks want to subject them to a slow death by processing human waste through the organs these animals need to live. Do not use other creatures for "medical assistance". Time to pull the plug on Ms. Cohen. She's a danger to others: the non-consenting animals. That is beyond disturbing! I hope the animals portrayed in these photographs were not real live "guinea pigs" in this project! Stop and think . . . what if the situation was reversed? but needs improvement. If the greyhound's tubes could be compressed down into a dog leash for use if the recipient is walking then it's beneficial for both the dog and the recipient. however I'm not sold on the dialysis. But, you could think of this as "energy saving" the electricity of machines wouldn't be needed, I wouldn't say it was cruelty to animals if the animal is given a new purpose rather than being put down.